The Leadership Debate Continues – Who Makes Better Managers? Ah, but that was then, and this is now. Nearly five decades after the song was released, men still dominate the business world, though not as completely as they did back then. In 2011, Jack Zenger and Joseph Folkman conducted a study of the leadership effectiveness of 7,280 business leaders – from line supervisors up to CEOs. Of these leaders, a full 64% were men, and not surprisingly, the variance of percentages between men and women increased as Zenger and Folkman looked higher on the corporate food chain. As they interviewed the subordinates, peers, and superiors, Zenger and Folkman discovered that in all but one area of competency and leadership, the women were rated more highly than their male counterparts, dispelling the commonly held notion that women’s superiority was based in a perception of their innately more nurturing management style. In the chart below, men and women were rated by co-workers to find which gender was superior in exhibiting specific leadership traits. The results show the percentages of those responses. As might be expected, women were also rated more highly than men on the traits typically associated with the stereotypical perception of women’s more nurturing management style, such as integrity, honoring commitments, and integration of feedback received from peers. They were also rated more highly in the willingness to exceed professional expectations. They were rated lower than men, however, in areas where a more global, long-term perspective was concerned. This was primarily because the majority of people holding positions of authority, and responsible for developing long-range strategic practices, were, in fact, men. There are a number of possible explanations about why women are rated more highly than their male counterparts in so many areas. While the argument about whether women are inherently more intelligent and/or capable than men is far from being settled, there are factors that seem reasonable to assume. For one thing, the sheer disparity in percentages of women versus men in leadership positions would tend to instill in the women the sense that they need to outperform men to be considered equal to them. 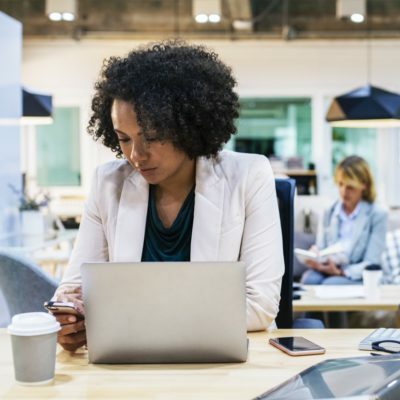 Being very aware of their minority status, women often feel pressured to constantly perform to keep their jobs, in a way that men who have grown more accustomed to and secure in their positions typically do not. Whether women will continue to be perceived as superior in so many areas as they assume a more fair percentage of leadership positions – and overcome the sense that they must over-achieve to compete with men – is a matter for debate and frankly, pure speculation. We simply do not know. Rebecca Gray This guest post is contributed by Rebecca Gray, who writes for background check . She welcomes your comments at her email id: GrayRebecca14@gmail.com.